be Kate “One Take Kate” Taylor. In his follow-up to the four-time Academy Award®-nominated blockbuster The Help, Tate Taylor directs 42’s Chadwick Boseman as James Brown in GET ON UP. Based on the incredible life story of ‘The hardest working man in show business’, the film will give a fearless look inside the music, moves and moods of Brown, taking audiences on the journey from his impoverished childhood to his evolution into one of the most influential figures of the 20th century. This stunning James Brown bio-pic has to be seen to be believed and is a must to see it ‘loud and proud’ on a big screen near you! Thanks to Paramount Pictures; One Take Kate has 1 of 2 double passes to GET ON UP to giveaway so you can see Chadwick Boseman’s incredible performance as ‘The Godfather of Soul’ for yourself. Head over to the GET ON UP review on One Take Kate to find the answer to the competition question. Email the answer to the competition question; your full name and postal address to onetakekatecompetitions@gmail.com to enter the draw and be in to win! GET ON UP in cinemas…too easy! 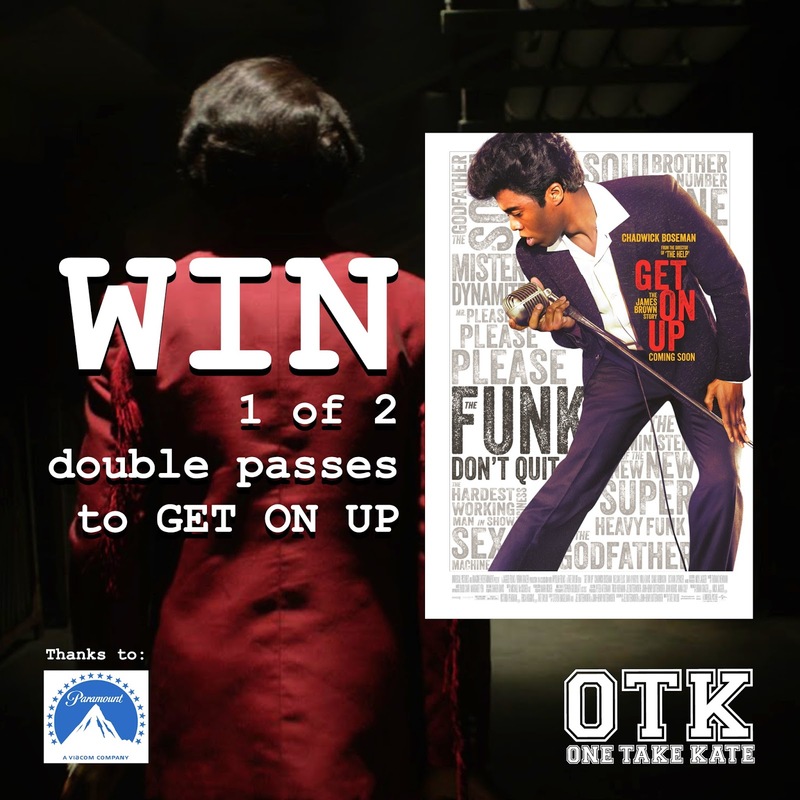 Prize details: 2 lucky OTK fans will get 1 x double pass each to GET ON UP; thanks to Paramount Pictures. All entrants that have commented on either the OTK Facebook page or OTK blog; have answered the competition question correctly and have a valid NZ postal address, will be eligible to win. Competition will be drawn at 9:00pm on Sunday 19th October 2014. The winner will be notified via email and also listed on the WIN with OTK page.